Krrb is a fantastic new online happy place that let’s you buy, sell, trade or give to your neighbors — locally and in-person. One of their members referred to it as ‘the lovechild of Craigslist and Etsy’. I am seriously giddy over this. 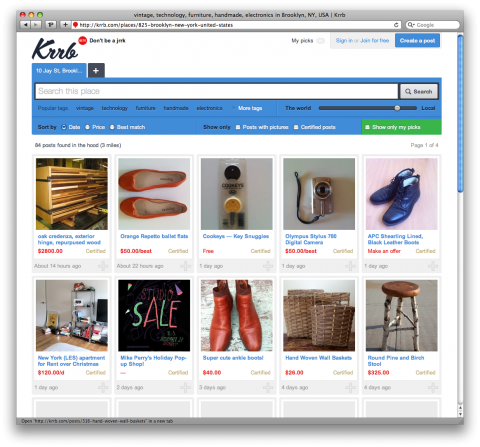 Most online shops and classifieds feel anonymous but Krrb.com is made exclusively for local and in-person commerce. Their mission is to create a fun, friendly and safe online venue that enables better and more personal face-to-face dealings between neighbors. They aim is to help turn local strangers into friendly neighbors. Think of Krrb as an online garage sale, block sale, flea market and local classifieds where second-handers, crafters, collectors, designers, artisanal food-makers and common folks can easily connect — taking advantage of all that the Internet has to offer — while retaining a personal and face-to-face relationship. Just signed up. Lovely site design and user experience. Looking forward to using this to find stuff for my future apartment! We have a project, where we get rid of one thing every day – we share this on our blog (in german). So this is just perfect and we’ll try it out! Thank you for letting us know about it and greetings from Zurich!